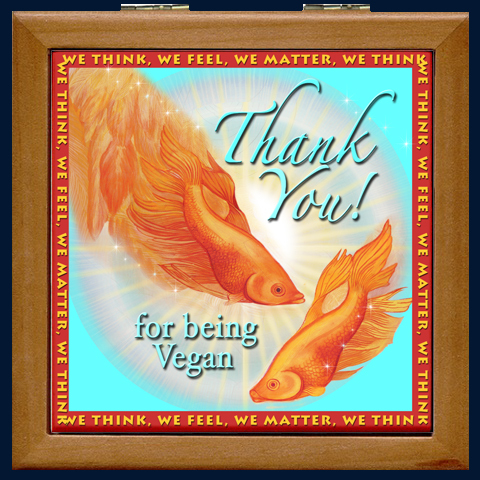 “Thank you for Being a Vegan” Altar Box is a supportive gift for the new vegan, and an attractive reminder for anyone. See it at our online store that also features 100% Organic cotton T-shirts, Animal Bereavement Cards, Altar Boxes, Buttons, Activist Shopping Bags, over eighty unique products. “Thank You!” also available as a print on fine art paper with archival inks 13 by 13 inches $50 unframed. © Art Copyright Nan Sea Love 2005. All rights reserved. 10% all profits gratefully donated to animal and environmental causes. Fish have nervous systems so really do feel pain. Numerous scientific reports from around the world confirm that fish feel pain. Researchers from the University of Edinburgh and University of Glasgow studied the pain receptors in fish and found that they were strikingly similar to those of mammals; the researchers concluded that "fish do have the capacity for pain perception and suffering. "There is much evidence that eating fish is perilous to you and your loved one’s health. The filmmakers have generously made availalbe the the whole documentary for free.